Two short stories, “V-Day 1978” by Cindy Rizzo and “Pistachio Heat” by Nikki Busch, provide you with a double dose of romance for Valentine’s Day and for every other day of the year. When Katie moves to Sojourner Womyn’s Land and is assigned Hillary as her orientation buddy, a strong attraction develops. But the community has a rule again “coupling,” which it regards as a vestige of patriarchy designed to treat women as property, and Hillary is committed to living by Sojourner’s radical feminist ideals. For a while, it appears that Katie will be unable to convince Hillary that they should be together—until right before Valentine’s Day when something unusual happens. Miri Rahimi is dreading her first Valentine’s Day since coming out at the ripe old age of thirty-five. But she’s decided to jump into the fray and attend the local lesbian Meetup at a pinball museum. Fearing rejection because nobody will want to be her “first,” she’s pleasantly surprised when she meets Van Wallace—a blonde butch with a wicked sense of humor. 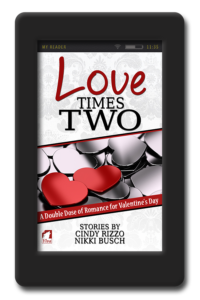 The heat between them builds over a game of pinball—until Van suddenly leaves Miri right before the stroke of midnight. Will Cupid bring them back together?